sailboat. 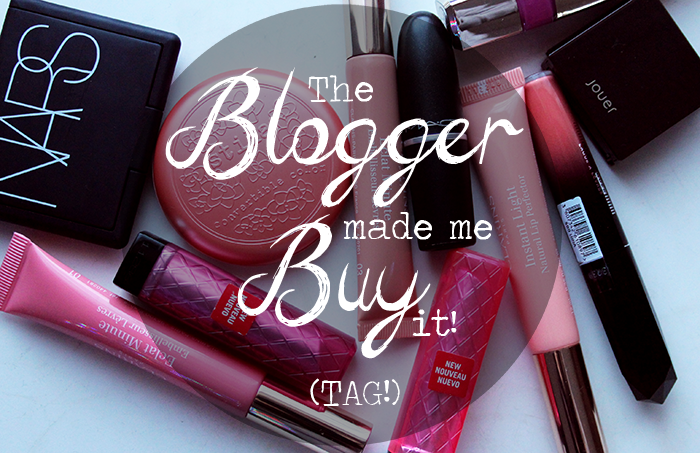 : The Blogger Made Me Buy It Tag! Amy from A Little Boat Sailing tagged me in The Blogger Made Me Buy It Tag last week and I've been really looking forward to having a few minutes to sit down and have a good think about my answers. I do love a good tag post & this is one of the best I've seen recently, partly because I really like talking about make up and partly because it doesn't take much to get me lusting over a product, I'm so easily enabled! Who are your most influential bloggers? Who are the ones that you really rely on for reviews and swatches? For this one I could quite easily paste in my entire bloglovin' subscription, if anyone mentions anything that sounds amazing, I totally end up making a little note of it. I honestly have so many favourites but a few that spring to mind off the top of my head are Girl With Make Up because I pretty much know I'll always like anything she mentions, Sleep and Water because her reviews are pure perfection and Blush and Brunch because I think we have fairly similar taste in pretty much everything! ...And because they're all completely wonderful and absolutely amazing! Do you buy a product solely as a result of one review from a favourite blog, or do you look for more reviews from others? It depends! If it's something that really catches my eye and I'm in a spending mood I'll totally purchase after just reading one review, but I usually like to read a few so I can try to judge if it's something that will work for me because everyone is different. What is your favourite item that you have ever bought as a consequence of blogs? 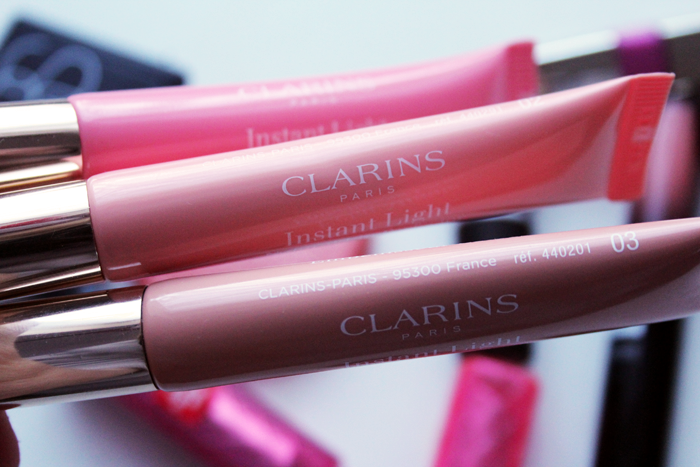 The Clarins Instant Light Natural Lip Perfectors, they are amazing with a capital A! So much so I have three shades and I've even repurchased one of them, which is pretty much unheard of for me and lipgloss! What is your least favourite item that you have ever bought as a consequence of blogs? I'm not the biggest fan of the Rimmel Apocalips. I only have one shade and the formula is quite nice, I just HATE the scent. It's the worst smelling beauty product I've ever come across! Name 5 products you have bought recently as a result of blogs? Have you ever given into a blogger hype? If so, which hype? Oh gosh, so so many! I was really excited about the Revlon Lip Butters & when they finally came to the UK I bought quite a few online without going and having a look at them. I still love them a lot so it was money well spent and they totally lived up to the hype for me! Have you ever avoided a blogger hype? If so, which hype? Is everything you buy based on blogger reviews or are there some items you buy without checking out a review? I rarely buy things on a whim anymore. I think it's because I have a lot of things in my collection already it's not often that I run out of something and have to quickly nip out and pick up a replacement. I also don't tend to go into Boots if I don't need to because I'll end up browsing and coming out with something I don't need at all. So if I do buy something beauty related it's usually because I've seen it talked about so much and my willpower has left me! I'd love to read your answers! Haha! The title of this made me laugh out loud as it takes so little encouragement for me to give in to a new beauty purchase - great post, Jennie! PS - I am looking into those Clarins Instant Light Natural Lip Perfector asap!!! thank you for the sweet shoutout :) i feel the same - i love everything you blog about, especially if it's a lip or cheek products, or bunny related! i would have to agree that clarins instant light natural lip perfectors are one of my favorite finds from the blogosphere. and i'm also trying hard to resist the urge to pick up the naked 3... i can't stop looking at pictures of it online though! Oh Im sure I've made many purchases just because I saw a product mentioned on Youtube or in a post! Being part of this community is bad for your bank balance! Great post Jennie! I just did this tag as well. It's a shame you didn't really like the Rimmel Apocalips Lip Lacquers, I actually don't mind them so much myself. Rimmel apocalips, I hate them! I thought I was the only one. I bought one, and I just, can't. I'm a big eyeshadow wearer, but the naked 3 hasn't appealed to me at all! I don't think they are universal as the first two as they are very pink toned. Its definitely hard to read blogs and not buy everything they talk about haha ! I was also really disappointed with the Apocalips, the formula was just so hard to work with for me! I really want Naked3, though.. I am also a serial avoider of Boots, it's a dangerous place! One of your posts was the reason I bought one of the W7 matte lipsticks & it is awesome so thank you!! Haha, i totally get you. I'm buying waaaay to much items after seeing them on other blogs (whoops). I looove posts like these! Funnily enough (and it feels like ages ago, where has the time gone?!) but it was your Revlon Lip Butter reviews that persuaded me to buy several, which I still love now and also I bought the vivo Tesco blush for the same reasons! 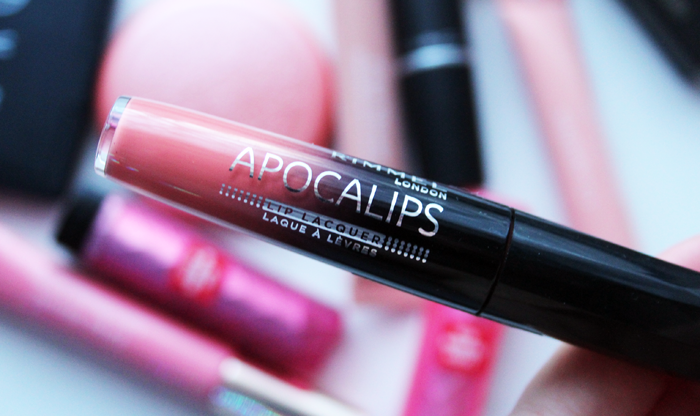 I must admit I really love the Apocalips range but typically I managed to get some of the bright pink shade stuck in my hair, not good haha! Lip Butters! I always pass by then wistfully when I'm in Boots hoping and wishing that there will be some new colours even though I know there never are. I'm just the same with eyeshadow. I have great intentions but I'm just not good at eye makeup unless it's a wash of one colour so the Naked pallets of the world are safe from me! agreed on Rimmel apocalips!! not a fan. Love this tag, tempted to do it myself :) there are so many things I am now aware of because of blogging and my makeup collection has grown massively :P agree about Naked 3, really want it but must resist!! Love this tag! I'm also a big fan of Sleep and water blog.. her pictures are amazing and I alos think they apocalips dont smell so good but gosh they are so pretty ! I'm never one for clicking on tags but as it was you I figured I'd check it out and I'm glad I did as it was a great read. Also I hadn't read any of the blogs you listed in the first question and they all look fab, so happy to discover them! Yeah the whole lip butter hype. Bought four of them and only liked one. Blogs and videos definitely influence me! I too find myself resisting the Naked 3.